The Story: I’ve found this beautiful shrimp on a sea urchin while diving in Anilao. 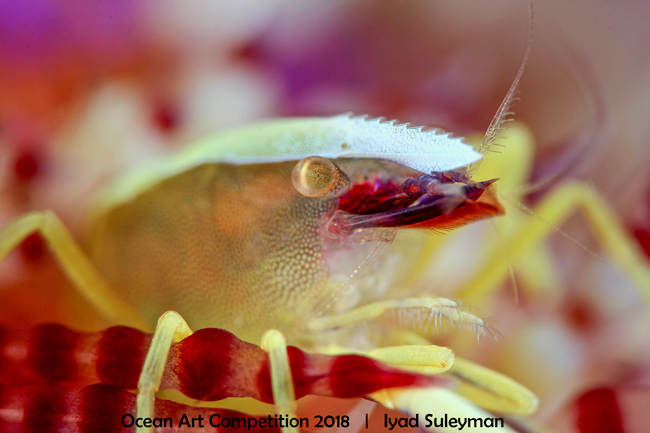 This creature is a commensal shrimp that lives in association with the sea urchin and takes advantage of its host when it moves on the substratum to collect its food, and also takes benefit of the potential food which can hang onto the sea urchin. This shrimp was tiny (less than 1 cm), so I used a powerful wet diopter to take it’s portrait and to fill the frame avoiding any cropping in post-processing. The Brooks sea urchin shrimp was moving slightly up and down on the sea urchin, so I was waiting for the right moment to take a shot, when the subject was exactly in focus. I was trying to capture the finest details and patterns of its body.